After a diploma in Fine Arts specialising in Murals in 1940 and a postgraduate course from Sir J.J. School of Art, Mumbai, KS Kulkarni went to Delhi in 1943 to study textile design. In 1945, he quit his job and joined the art department of the Delhi Polytechnic and became a member of Delhi’s All India Fine Arts and Crafts Society. In 1947, he founded two creative spaces: Delhi Shilpi Chakra and Triveni Kala Sangam. His works can be considered to be in between expressionism and neoclassicism. Kulkarni uses abstract landscape with angular bold lines, smooth surfaces, and shaded areas to emphasize chiaroscuro in his works. 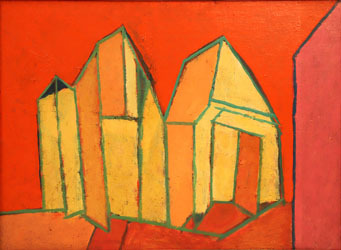 He often used his modern aesthetics with cultural and rural subject matter. Kulkarni was a fine colourist and used unexpected combos, experimenting with fresh, bright colours to depict his work.